This is a popular winter activity carried out on a sled pulled by Nordic dogs. It allows you to enjoy nature by going through stunning tracks and forests. These dogs are properly trained; they enjoy what they do, they instinctively know which ways are the safest and they are also extremely faithful. This activity is only offered to small groups. 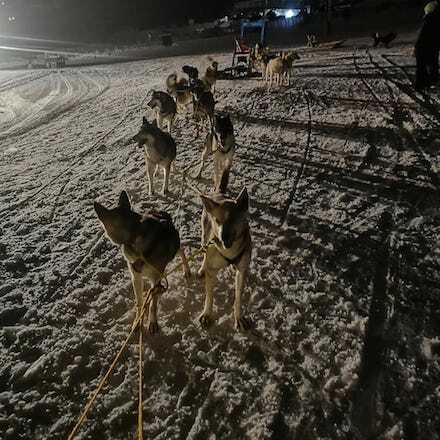 A unique experience under the moonlight: sled dogs ride, snowmobile excursion and then a delicious dinner will be the icing on the cake to such a unique night-time experience. Minimum 2 people. Sit down in the sled and guided by the musher and his huskies, who will lead you through the most mesmerizing places of the valley. Let you being driven by the musher and his huskies, who will lead you through the most mesmerizing places of the valley. Spectacular night-time mushing ride and delicious dinner in a mountain restaurant.